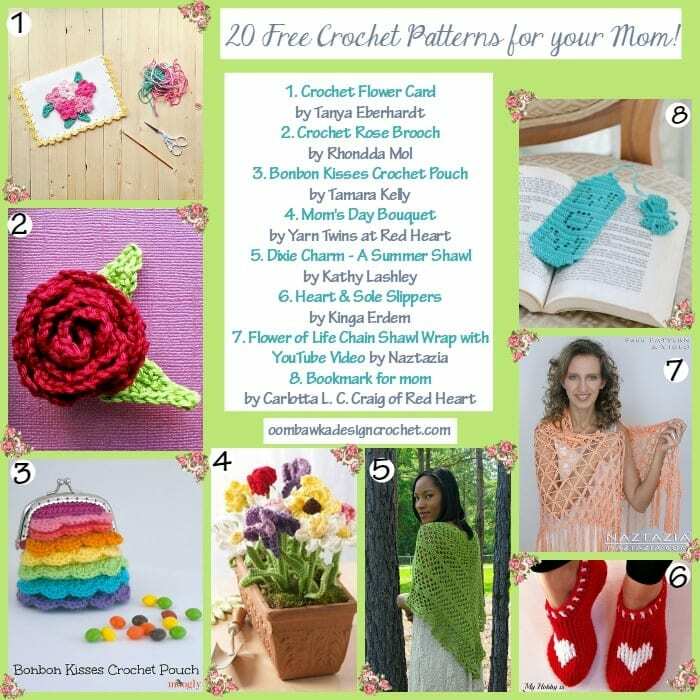 You are here: Home / Free Crochet Patterns / Free Pattern Friday / 20 Free Crochet Patterns for Mother’s Day! A little bit of this and a little bit of that – this round up is filled with possible ideas for you to use to create something handmade for Mother’s Day! We have cards, bookmarks, shawls, wraps, brooches, slippers, picture frames, change purses, flowers…and lots more! 20 Free Crochet Pattern Links all in one place. I hope you can find something you would like to make – a special gift for a special someone. Have fun! If you are a Designer without a Website; or a Designer looking to grow your audience – please read my post to find out more about my Guest Post Contributor Opportunity! I am very excited to be able to offer this opportunity! This pattern is located on a web site that crashes. I am wondering if you can send me the pattern to my e-mail address…. I have tried everything to get to the site, but nothing works. I have windows 8.1 on my PC and use internet Explorer. Everything is up to date with the latest updates.